Cats were of great significance to the Celtic people. In Scotland the Stewart clan had the cat as a totem animal and this totem covered the confederacy of a number of tribes, clans and families. Kataobh, cat country, now known as Caithness, is named after a Pictish tribe, the Kati cat people. In one of the Irish Otherworld voyages, a little cat is encountered as a guardian of treasure; in maintaining its watch, it turns into a flaming form, and leaping its way through a potential thief, turns him to ashes. The cat is usually a female totem, dating back to ancient Goddess worship. 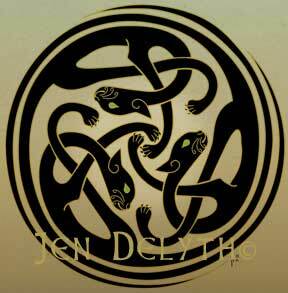 In this design, intertwined triple felines indicate the symbolically significant number three which is most sacred to the Celts. Cats are said to have nine lives - nine is a multiple of three. This design is adapted from a tiny fragment of the Book of Kells.